Originally published in 1952, this title looks at how various creative crafts were taught in school and whether this had the ability to eventually transform our social environment. 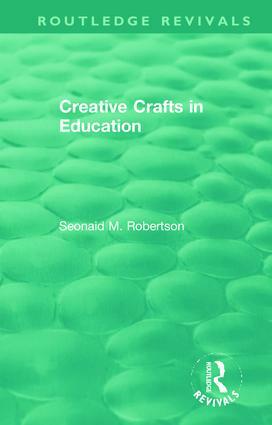 The author looks at craft education first in the primary years and then in adolescence, she goes on to examine specific crafts in more detail. Foreword by Herbert Read. Introduction. 1. The Children We Teach 2. ‘Combined Operations’ in the Primary Years 3. Group Sessions 4. Purpose Shapes the Form 5. The Value of Crafts in Adolescence 6. The Practice of Crafts in Adolescence 7. Wood 8. Modelling 9. Pottery 10. Carving 11. Bookmaking 12. Lino Pictures and Fabric Printing 13. Needlework and Embroidery 14. The Adolescent Girl and Her Clothes 15. Craft and Drama 16. Our Environment. Conclusion. Appendices. Index.